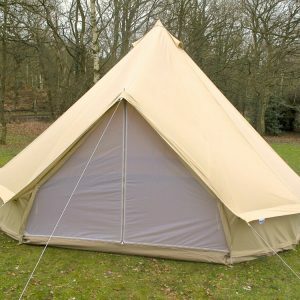 Bell tents are such a distinctive and practical way to camp, outperforming their nylon cousins in every way. Even though they may be slightly heavier, the end result holds no comparison. 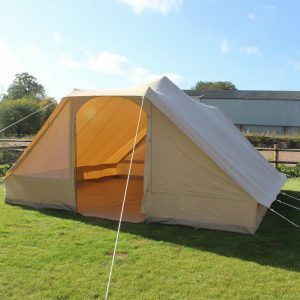 All our Bell tents come complete with a zip ‘on and off’ groundsheet that is fully detachable from the tent fly. With this design you have all the security and piece of mind that you are completely protected from the elements. It has the added feature of being able to roll up the sides on a hot day creating a shady, cool space in which to relax. 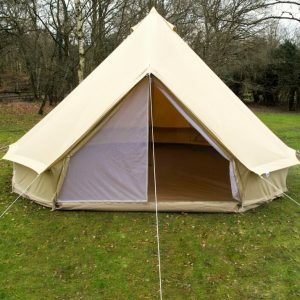 Our bell tents are a natural and sandy colour to complement nature. The bell tent’s elegant and conical shape means that the inside is a wonderfully open plan, communal space with plenty of head room. Even on the dullest of days the bell tents canvas will radiate a bright and warm ambience inside. 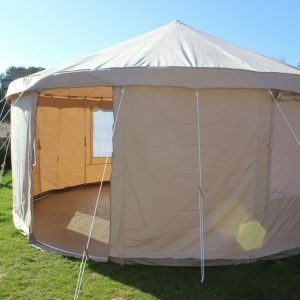 It can give the impression of being in a tipi or yurt, especially when fitted with a wood burning stove, at just a fraction of the price and weight. 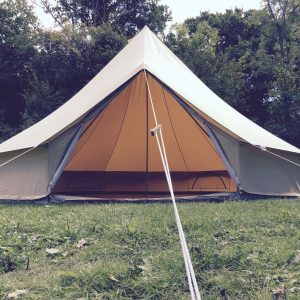 The bell tent has numerous uses besides camping and music festivals. It fits perfectly for wedding and party accommodation, kids party/play areas, garden shade/chill out areas and treatment/massage rooms. The bell tent is also extremely versatile when it comes to dressing and decoration. It allows you to retain an original, bushcrafty feel or embrace the glamping trend by creating a more luxurious and chic interior. The options are endless. And, like anything in life, if maintained correctly and treated well, your bell tent will take care of you and last for many, many years.